GEORGETOWN,TX - The recording stars ALABAMA said, ".....if you're going to play in Texas, you have to have a fiddle in the band." Senior softball players say, "If you're going to play in TEXAS, you have to play SPA'S LAYLA BRYAN MEMORIAL tournament." Not to sound like a broken record but the MCMASTERS ATHLETIC COMPLEX in GEORGETOWN, TEXAS again drew THIRTY PLUS teams to the ANNUAL LAYLA BRYAN MEMORIAL SPA tournament.
" I think the drawing power of the event is a great tribute to LAYLA," SPA PRESIDENT/CEO RIDGE HOOKS said, "This tournament was LAYLA'S baby, she put her heart and soul into it every year and today it continues to flourish in her memory." Seven divisional bracket champions were crowned this year starting with HILL CONTRACTING in the four-team 75/80 bracket. The TEXAS team went 3-0 in bracket play beating TEXAS CLASSICS 24-9, HARRIS AUCTION 18-11 and edging HARRIS AUCTION 12-11 in the title game. ALAMO CITY TRAVELERS rounded out the field. Five teams squared off in the five-team 70 PLUS group. OKC RELICS ran the table on the way to the title. OKC disposed of STILL (25-10), TEXAS LEGENDS 70's (24-18) and beat the TEXAS LEGENDS again, this time 15-13 for the championship. Others in the bracket were AUSTIN WIZARDS and TEXAS CLASSICS 70's. In a three-team 65 PLUS SILVER bracket the DALLAS SPURS took the top prize after beating TEXAS RATTLERS (41-19) and TEXAS EAGLES (22-17). CENTEX 65'S won the 65 PLUS GOLD wrapping it up on a forfeit win over SAN ANTONIO LEGENDS. Earlier CENTEX beat BOYD METALS 29-14 and SAN ANTONIO 23-19. The TEXAS LEGENDS were the fourth team in the bracket. HOUSTON FIRE beat AUSTIN WIZARDS 18-16, OOPS SOFTBALL 23-8 and TEXAS THUNDER 23-18 in the title game of the five-team 60 PLUS group. 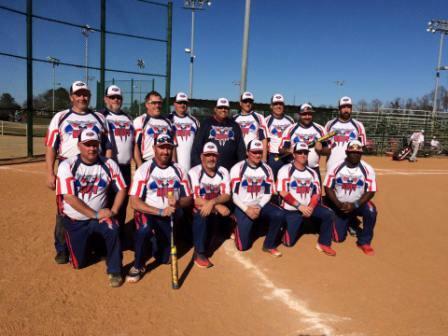 The 55/60 MAJOR CROWN was won by SAN ANTONIO 55 SOFTBALL CLUB. LEGENDS OF TEXAS were SECOND followed by GONZALES INSULATION 60's. A neighboring state team, TEAM ARKANSAS won the 50 PLUS PLATINUM crown beating TEXAS PLAYERS twice including 37-19 in the title game. The TEXAS PLAYERS reached the finals by knocking off TEXAS MAVERICKS 37-24. TEXAS ELITE swept the competition in winning the 50 PLUS GOLD bracket championship. TEXAS ELITE beat MIXED BREED 26-15 in the finale. MIXED BREED came out of the loser's bracket by beating AUSTIN ROCK 29-24. It was a tough tournament for AUSTIN ROCK who lost their two bracket games by a total of only six runs, five runs to MIXED BREED and one run (15-14) to TEXAS ELITE. SPA will return to the LONE STAR state AUGUST 26-30 when COLLEGE STATION will host the SPA SALUTE TO VETERANS NIT. Please contact SPA OFFICE at (405) 376-7034 or E-MAIL spaoffice@softballspa.net for further information. MONTGOMERY, ALABABMA - Combine a great location with the reputation of a well-run tournament and the result is predictable. For the third straight year the SOUTHERN SPA NIT IN MONTGOMERY ALABAMA an increased attendance, this year attracting FORTY TEAMS. Tournament Director for the 2015 MONTGOMERY TOURNAMENT DON CHERRY also was excited about the continued increase in teams. The forty-team tournament at MONTGOMERY, MARCH 12-15 saw EIGHT CHAMPIONS crowned in the 50, 55, 60, 65 and 70 age groups. ADIKTIVE MERCHANTS ran the table in the 50 MAJOR BRACKET downing TEAM ARKANSAS (31-14), DOC C'S (34-33), MONSTER SOFTBALL (32-25) and MONSTER SOFTBALL again, this time in the title game 35-24 to take the top prize. Others in the six team bracket were ALABAMA BRICK and ATLANTA MONRACH MIKENS. In the 50 AAA team, another GEORGIA TEAM, MAJOR LEAGUE MIKEN, went home with the “brass ring”. MAJOR LEAGUE MIKEN downed AFINITY ELEVATOR 10-5 and BLUEGRASS SOFTBALL twice (20-15, 28-15) for the 50 AAA crown. Three teams battled in the 50/55 MAJOR PLUS BRACKET with TSC MIKEN coming out on top, TSC had to beat PLE 41-34 in the “IF” game to escape with the title after PLE forced the deciding match with 31-25 win over the “champs”. TENNESSEE'S EDGE SOFTBALL bested FLORIDA'S DAVID BOWEN SPORTING GOODS 34-15 and 23-22 in a best two-out-of-three showdown for the 5/60 MAJOR CROWN. The 55AAA title went to DT EXPRESS, who had to survive a late rush by GAS. In the four-team bracket, DT EXPRESS sent GAS into the loser's bracket with a 19-18 win in the opener. The EXPRESS gang took care of the BAMA OLD GUYS 31-20 in the next game and then sat back and waited for their next opponent. In the meantime, GAS eliminated JR TRUCKING 24-9 and the BAMA OLD GUYS 17-7 to earn another shot at DT EXPRESS. This time GAS won 24-15 to force an “IF” game. The title game was close all the way but DT EXPRESS held on for the 16-12 win and claim the 55 AAA crown. SIX TEAMS squared off in the 60 BRACKET with RANDY SMITH going undefeated to win the championship. It wasn't easy though as the champs had to survive a pair of one-run wins on their way to the title. RANDY SMITH knocked off COLUMBUS LX 24-19 and BOYS OF SUMMER 23-22 before beating COLUMBUS LX 16-15 in the title match. COLUMBUS LX after losing the opener to RANDY SMITH beat ATLANTA RECYCLING, STRYKERS and BOYS OF SUMMER to make it to the championship game. DIXIE SOFTBALL and RANEW rounded out the six-team bracket. MUSTANGS won the four-team 65 BRACKET with three straight wins over EXTREME HEAT and HUFFMAN ELECTRIC twice. SLO SOX was the fourth team in the bracket. SOUTHEAST LEFTOVERS made up for their 2014 runner-up spot by winning this year's 70/75 title. The 75 MAJOR LEFTOVERS claimed the crown beating 70 AAA BROOKS AND CRIM 12-11 and 75 MAJOR ED'S ALUMINUM 20-4. The 75 AAA GEORGIA CLASSICS filled out the four team bracket. "It was a great tournament and we expect to increase attendance again next year," concluded CHERRY. Michigan Mavericks, the Oldest Women’s Senior Softball Team. Kay Oswait, 90-years-old was the coach and Jerry Gawara, at the time was 92-years-old. Kay just passed away three weeks ago after suffering from cancer for 12 years. The Michigan Mavericks are from Garden City, Michigan. Kay Oswait was born in Brownsville, Pennsylvania. She played fast pitch, modified fast-pitch, and then slow-pitch softball. She was a pitcher, catcher and outfielder. She began playing senior softball in 1989. She was manager and player despite some major health issues. She had a fall in 2007 resulting in a fractured hip and thereafter became the manager of the Mavericks 75+. Kay is one of those pioneers that paved the way for all the younger female players. Kay wrote about Jerry Gawara – She is now 91-years-old and would still be playing if we had enough players over 80 to play In 1988, Jerry played shortstop in the Women’s Senior Olympics in St. Louis. One of Jerry Opponent wrote, “I had the privilege of playing against her (Jerry) as well as with her. She played various positions but noted for her stamina with her pitching. She was a good hitter. Jerry’s personality is one of graciousness and humbling demeanor. She is competitive, but in a civil way. She cares about others on the team and opponents. Because of Jerry, Judy Lee had the pitching rule changed to allow her to pitch 2 innings, rest, and then come back into the game; plus allowing 12 players on the field for this age group. Below is the Women’s Softball Tournament Schedule for 2015. If you happen to live or happen to be in one of these cities during tournament play, please stop by and cheer them on and welcome them to your city. Oh No, My Roster’s Been Frozen! …. What Now? The question is asked again and again at softball events everywhere, and the answers may not be the same depending upon the sanctioning organization rules for any particular tournament. So let’s talk about SPA’s rules, what they mean, and why they might be the way that they are. Why do we have such rules? When softball players or athletes in general come to the park to compete, it’s just human nature that everybody wants a chance to be competitive or at least a glimmer of hope that they might win. For that reason, most softball organizations, SPA included, try to “classify” the teams, such that similar skill levels wind up competing together. Let’s face it nobody (win or lose) enjoys the “run-away” games that wind up forty to nothing embarrassments. So teams are grouped and classified to try to give everybody a sporting chance. Classifying teams is a difficult task at best, when one considers that these teams are traveling and playing all around the country, sometimes with one organization and sometimes with another. The task of evaluating and classifying teams becomes almost impossible, when the teams show up with different players at every tournament. Let’s face it there are too many teams out there that will “load-up” with new and better players at every opportunity. While we all understand that it is a necessity for teams to occasionally replace players, constant wholesale change just to “sandbag” and build a team that is stronger than its classification is wrong, and destroys any chance of proper classification for that team as the season progresses. To make classification meaningful in both its men’s and women’s programs, SPA has chosen to “freeze” each team’s roster, when that team plays its first tournament of the year. In other words, when a team “qualifies” for the World Tournament by playing in any SPA tournament, that team’s roster is going to be held to rules designed to maintain the team’s classification. What does “frozen” mean? Are we stuck? Does this mean that I can’t play anywhere else? There is a great deal of misunderstanding as to what a “frozen roster” really is in SPA, so let’s see if we can answer some of the concerns. First of all, a player is NOT stuck on a roster once it has been “frozen”. SPA has no restrictions on players being dropped from a qualified roster, except to say that once dropped a player may not return to that same qualified team. No releases or approvals are required. So if a player wants to leave their team to join another team, he/she may certainly do so, as long as he/she is eligible to be added to their new team’s roster. Likewise, it is legal in SPA for a player to be on more than one roster and play with more than one team, as long as those rosters are for different age groups. There are special rules concerning “double-rostering” that allow for playing on two teams in the same tournament with restrictions, but as long as a player is playing with another age group on separate weekends, then there is no problem or restriction. What if a player is sick or injured? Are we just out of luck? Once a team’s roster has been “frozen”, everybody understands that there will be times when illness, injury, or unforeseen circumstances will require an additional player. To try to accommodate these needs, SPA allows any team to add 2 players to its “qualified” (frozen) roster, but to try to keep the classification issues in line they require that these players come from a higher age division. This way a team can still keep their qualification to World, continue to compete, and yet still remain within their current classification rating. Is there any way that a roster can be “Unfrozen” so that we can start over? Sure, we all know that a situation may arise that forces a team to have to totally regroup and just start over. Whatever the circumstance that might cause this to happen, because now we are dealing with groups of new players from the same age group, it necessitates the need for a brand new evaluation of that team’s classification rating. For that reason, SPA requires a team that needs to be “unfrozen” to officially register that need, so that the roster can be opened and the classification review process can begin anew for that team. In line with this review, the team is required to “re-qualify” for the World tournament by playing in an additional SPA event. This re-qualification gives the classification committee an opportunity to evaluate the newly formed team in a game situation. We all wish that this was an ideal world, where every team is competitive and the old “you get yours and we’ll get ours” mentality could work, but that’s just not the world that we live in. The rules that SPA has put in place represent a very honest attempt to make the game more enjoyable for all. Once again it is the season to be thankful. We have had a year of wonderful tournaments with the comradery of all of our old and new found friends in softball that only tournaments can provide. In 1997 is when I first went to USSSA as the Women’s Director with our Tennessee State USSSA Director Randy Smith is where I met Ridge Hooks, Executive with USSSA at that time. Between Randy, Ridge and Billy Lee Yarbrough they helped me get our first USSSA Senior Women's World Tournament in Nashville, TN in 1998. We had 6 teams and built it from there every year. For twelve years we only had one tournament a year until I went with Ridge Hooks at SPA as the SPA Women's National Director. Ladies and Gentleman we now have 6 tournaments a year, thanks to Mr. Hooks believing in the women's program. &nbspDecember 9-12th, SPA will have an Executive meeting in Yukon, OK where we will have viable discussions and hopefully solutions to change some things that the coaches talked about at our meeting in Dalton, GA. The Dalton meeting was very successful and all of our Executive Committee was there to hear the Coaches’ giving their great ideas for 2015. So Ladies 2015 will be a great year for all of us. The SPA Staff Members would like to thank each and every team for playing in our Association in years gone by and the many years to come. We also wish each and every one of you a Merry Christmas and a Very Happy New Year. God Bless Everyone.